and I couldn't resist dragging them over here. Me missing BYJ with long hair ! Never thought I'd say that ! And me moaning about his long hair before... wishing for him to cut it ..sob..
but she's going to make me eat my words too !! ]. is what made me become a fan. 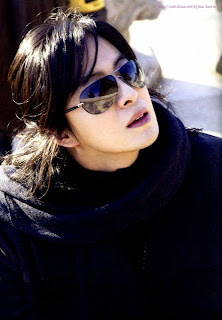 or 'Winter Sonata look" or "April Snow look'. well I explained on the sidebar about that. Anyway, by now you know my posting style...which is "as I like it"
and mostly "if I have the time to" LOL ! Err...you might have an itsy bitsy headache by now reading this ^__^..
go and get yourself an ice-cream, Ok ! ROTFLOL! 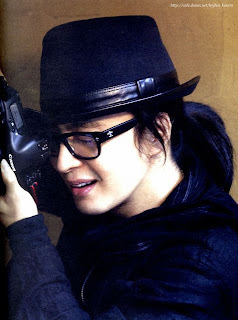 A lot of sisters are starting to realize they miss Yong-Joon-ssi's long hair. I hope he grows it out again and has it made into brushes for his lacquer painting master. a mi me necanta BYJ con el pelo corto, se ve muy lindo, pero en lo particular me fascina mas con cabello largo. He he...Tamar, I'm waiting for news on that brush ! Oh...Cecy...you like him more with long hair too? You're like Tamar then !